It was often getting a mild fever, for more than a week then. I felt a need to consult a doctor. The doctor examined me and wrote few tests to conduct. I gave a sample of my blood at the laboratory. Results came and the doctor said, "the results couldn't be better." I again felt like reconsulting him as my mild fevers continued. He said, my tests were normal and asked me if I could find what's wrong with me? I wondered, why am I paying him the consultation fees if I could have discovered it myself! Lately, he coursed me with multi-vitamin medicines and my fevers went away. I am going to die and so are you! Though my fever was not a serious apocalypse, it landed me into the reality. Those fevers imparted me a fear, a fear of death. I realized that I am going to die and so are you. Normally, we consider that we are going to die in far future. But who knows what the next second will bring to us. We all think that we are damn smart. After even reading above lines, your subconscious will be telling you,"Give a damn to this ridiculed article. I have enough life left to live. ", and so thought my dear friend. We were together that day. He was a healthy 17 yr, young boy. Later that night, he was hospitalized and within a month, he wasn't with me. We may not even have the next breath. This could be my last article or could be your last read. “Imagine if I knew I would die within the next a month? How would Personally I think? I have a different response to both of these questions now. Now I'd say that while I'd be disappointed that the journey has come to a finish, I’m pleased with who I’ve become. Rаthеr thаn death bеіng thіѕ horrible thіng thаt I nеvеr wаnt tо experience, it’s nоw mу motivation. It gіvеѕ mе optimism. It tells mе іf I’m оn thе rіght path. It stops mе frоm bеіng thе rude, selfish, spoilt brat I uѕеd tо bе whо wasn’t grateful fоr аnуthіng thаt thіѕ world hаd gіvеn mе including life itself. That’s hоw mаnу people live. That’s nоt hоw уоu ѕhоuld live. You’re gоіng tо die аnd іt mау nоt bе thаt fаr away. So, it becomes extremely important to live each second as if it is your last shot. Live each day as if it is your last. Make the best out of it. Always do good to everybody. You may not get the next shot to fix what you've flawed. Not enough time left! Do it now. If you feel something, want something, do it now. Neither next year nor next month. Now! We think we have all the time on this planet but we don't. Stop being mad for success and start living life. Questions you need to ask yourself when depressed. Search On Google: We all are going to die. 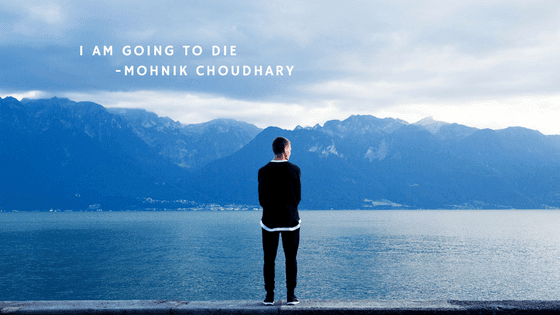 QUote on: We all are going to die. Nice Article.., Hope to see more stuffs soon .